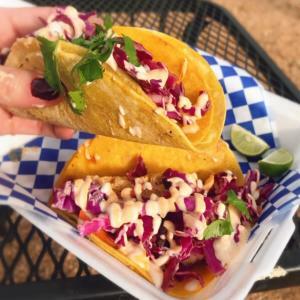 You might not run into them on a daily basis, but there are a surprising number of food trucks popping up and hiding around corners in New Braunfels. Some do catering, some have a (mostly) permanent location, and some just appear for special events. All, though, are supremely appreciated and (non-creepily) stalked by us at GoodEatsNBTX. 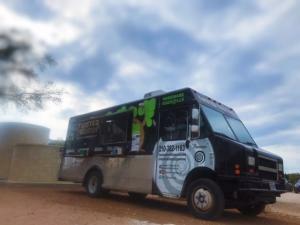 Here are 5 Food Trucks in New Braunfels that you should find and follow. 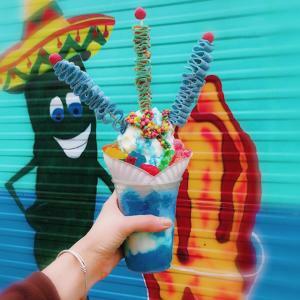 A newcomer on the New Braunfels scene! Owned and operated by Texas natives, Bob and Leslie Posey. Both have experience in the restaurant industry and competitive barbecuing. They cater as well as run their food truck. 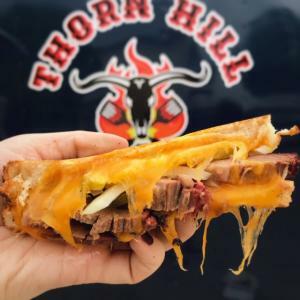 On my visit, I ordered the Brisket Grilled Cheese ($11) which was tender juicy brisket with sliced onions, pickled jalapeños, and melted, drippy, gooey, delicious sharp cheddar cheese with a satisfying small resistance when you pulled the sandwich apart. I was into that cheese. The jalapeño pickles were just the right amount of kick to combat the rest of the savory ingredients and dipped in the provided slightly acidic, sweet/sour BBQ sauce, it was absolutely amazing. Current favorite sandwich. I need more. The mac and cheese ($2.25) was smoked, so it was not as goopy as Kraft might be (not that you want to impersonate Kraft...) but it was not dry at all. Rather, it was creamy, with an intense smokey flavor and a bit of pepper. Highly recommend this as well. Twisted Traditions does traditional German, American, Asian, Italian food with a modern twist thrown on it. 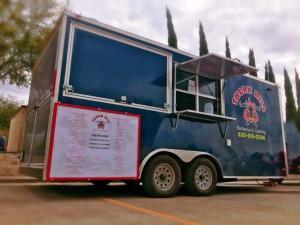 They seem to be mainly a San Antonio food truck that comes down to New Braunfels off and on and also caters. I caught them at 5 Stones Brewery off of 1863 in New Braunfels. It&apos;s down a winding country road with no signs, but if you keep your eyes peeled when your GPS says "you&apos;ve arrived", one gate/driveway in the area has a collection of flags, and one of those flags has five black circles on it (5 stones! Get it?!!). Turn down the driveway and you&apos;ll find a large brewery with an open-air tasting room and garden seating. It&apos;s lovely. I ordered the Korean Street Tacos with BBQ chicken, topped with Asian slaw, cilantro, and a spicy mayo. They&apos;re light flavored and juicy, and I definitely recommend completely juicing the provided limes on them for the added bit of acid. The egg rolls are (if I surmised correctly) a traditional recipe from 1977 in Okinawa. They came with fries and a tangy, citrusy dipping sauce that paired nicely with the fried crispy rolls. Rock N Dillies is amazing. Just hands down amazing. It&apos;s the kind of over-the-top *EXTRA* food that not only shatters your follower&apos;s Instagram feed, but is also super intelligently put together yummy foods. The Blue Paradise was lovely though! Coconut ice cream, shaved ice with blue coconut syrup, and gummy bears and sour patch kids that get all hard and extra chewy from the cold. The ice cream melts its way into the blue ice and gets that creaminess that Hawaiian shaved ice always has. It was garnished to adorable-ness with nerd rope and sour belt sticks. Sooo good! 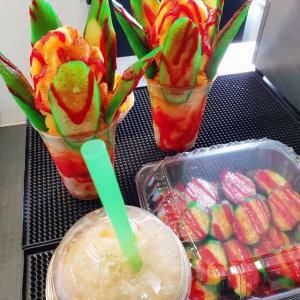 I will be searching them out soon to try some of their foods that are chamoy (Mexican sauce that&apos;s salty, sweet, and sour with chile) doused. They look amazing! 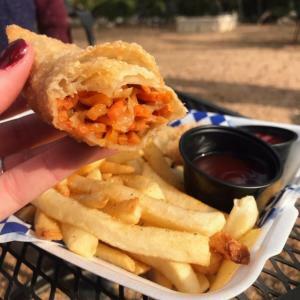 A mobile New Braunfels staple run by super sweet people and the very first food truck I hunted down since moving to New Braunfels. 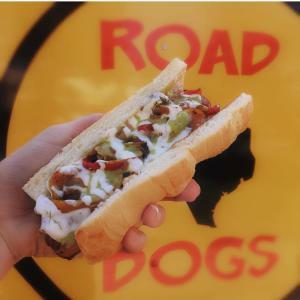 They make huge 1/4 pound deep fried, all beef hotdogs and then make them cRaZy, in the bestest possible way. I tried the *Fajita Dog* on my trip, with all the fixings. It rocked a slight spicy kick and creamy combo with it&apos;s avocado salsa and sour cream drizzles. It was super filling and a meal a la carte, but it came with chips and salsa as well because thats what Fajitas deserve. Absolutely D-licious. I&apos;ve been eyeing their cheese doused fiery Cheetos dog in IG and will be making a trip out soon. 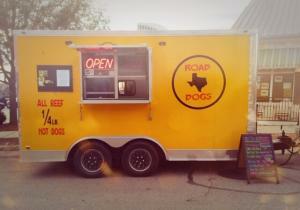 Another newcomer on the New Braunfels scene! Woohoo! 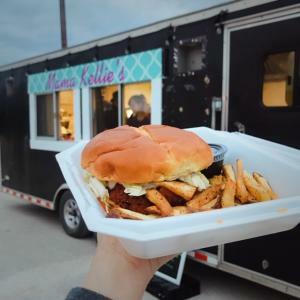 I caught up with Mama Kellie&apos;s, a cute little food truck peddling gourmet versions of classic diner dishes, at Riley&apos;s on the BackBone - THE BIKER BAR. I somehow didn&apos;t realize it was a biker bar until I showed up and had a good laugh at myself while I waited for my burger with my two tiny kiddos playing tag, sprinting in circles around me, across the parking lot from the music, the leather-decked out bikers revving their engines at each other and smoking cigarettes on the porch. Fish out of water. Fish out of water with kids in tow. Fish out of water with kids in tow choking on her laughs. Fish out of water with kids in tow choking on her laughs while eating tasty food! It was good times. I ordered the Kickin Chicken ($11), a homestyle, fried, breaded, juicy chicken burger smothered in buffalo sauce, with greenery, creamy ranch coleslaw, pepper jack cheese, and bread and butter pickles. It was a perfect mix of spicy, slightly vinegary, intense buffalo sauce combined with tangy, creamy ranch. Adored the burger! There was a bit of a crunch to the bite, and it stung the lips just slightly after biting into it, but didn&apos;t have enough of a kick to be distracting or mask the flavors. 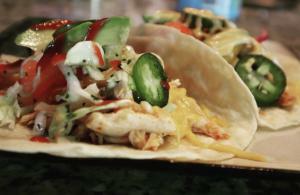 Next on the list: Their Mahi-mahi fish tacos that tote being sweet and spicy. Nom! This is by no means a finished list! We will be putting out another *5 TRUCKS TO FOLLOW* post shortly! Stay tuned and please send us any suggestions of places to try or tag us @GoodEatsNBTX with your favorite places!